line. It is 32bits wide internally. In 1985, Intel introduced the 80386. Like the 80286 before it, the 80386 added significant programming and addressibility enhancements. Protected mode was enhanced to allow easy transitions between it and real mode (without resetting the microprocessor). Another new operating mode (v86 mode) was introduced to allow DOS programs to execute within a protected mode environment. Addressibility was further enhanced to 32-bits, giving the 80386 four gigabytes of memory addressibility (2^32 = 4 GB). Also like the 80286, the 80386 was not introduced in any computer systems for many years after its introduction. Compaq was the first mainstream company to introduce an 80386-based computer -- beating IBM to market. Regardless, the 80386 enjoyed a very long life for home and business computer users. This long life was largely due to the programming extensions in the 80386 -- namely the ability to create a protected mode operating system to take advantage of all 4 GB of potential memory while still being able to run legacy DOS applications. Shortly after the 80386 was introduced, Intel introduced the 80386 SX. To avoid confusion, Intel renamed the 80386 to the 80386 DX. The SX was a cost-reduced 80386 with a 16-bit data bus, and 24-bit address bus. The 16-bit data bus meant the SX was destined to have lower memory throughput than its DX counterpart; while the 24-bit address bus mean that the SX could only address 16 MB of physical memory. Regardless of the address bus and data bus differences, the SX and DX were software compatible with each other. 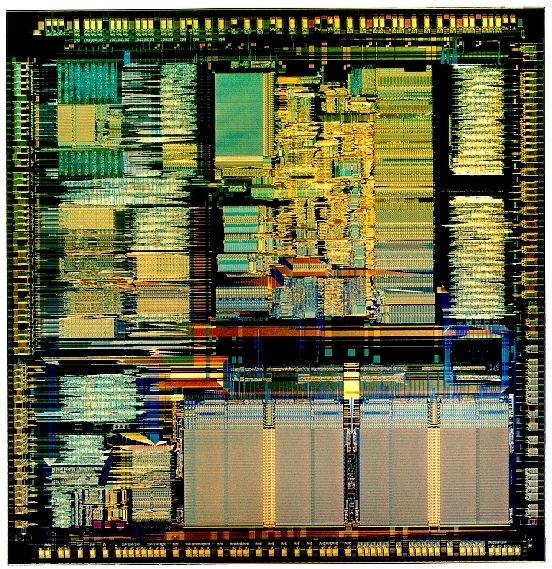 Intel also introduced the 80376 as part of the 80386 family. The 376 was an 80386 SX that exclusively ran in protected mode. During its long reign, the 80386-based computer began to evolve. Chipset vendors began dreaming of ways they could help improve the performance of the computer, thus giving their products a competitive advantage. One of the innovations was the introduction of the memory cache. The memory cache within the chipset would play a huge role in Intel's future product plans. First, Intel introduced a cache . Later, they incorporated the cache into the microprocessor itself. Intel also made their second failed attempt at chip integration. The 80386 SL integrated core logic, chipset functionality, and power-saving features into the microprocessor. During this time, the popularity of the personal computer, and most notably their Intel microprocessors, didn't escape the notice of many entrepreneurs wishing to cash in on Intel's business. AMD began their own "x86" microprocessor division. IIT began cloning the Intel math coprocessors. Other small startups, such as Cyrix and Nexgen, decided they too could design an Intel-compatible microprocessor. The aspirations of these companies didn't bode well within Intel. Shortly thereafter, Intel began taking measures to ensure their own dominance in the industry -- to the exclusion of everybody else. Hence, Intel began what many believe are anti-competitive (illegal) business practices. In spite of Intel's business practices, many 80386 clones began to appear. AMD marketed the Am386 microprocessors in speeds from 16 MHz to 40 MHz, though it was possible to overclock this chip up to 80 MHz. IBM introduced the 386 SLC, which featured a low-power 386 with an integrated 8-KB cache. IBM created other 386/486 hybrid chips -- some that were pin-compatible with Intel, and others that were not. Chips and Technologies created their own 386 clone. Cyrix stunned everybody by offering a 386 pin-compatible CPU, but called it a 486 (a nomenclature pattern that Cyrix still uses). Texas Instruments served as a foundry for Cyrix, and negotiated rights to produce chips under their own name. Eventually, TI produced their own chips (based on the Cyrix core), with their own unique enhancements.